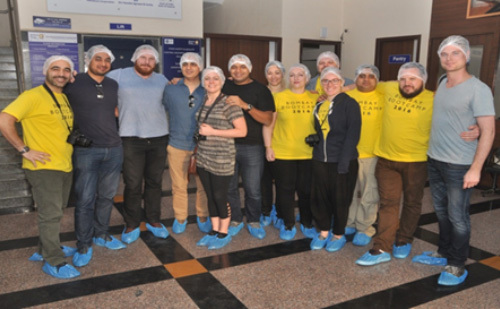 Akshaya Patra’s Ahmedabad kitchen facility was visited by 11 members of Dishoom from U.K. on 26 February, 2016. Dishoom is a London based Mumbai café that has been ranked first in Yelp’s Top 100 places to eat in the U.K. The guests on reaching the facility were warmly welcomed by the Akshaya Patra team who took them around the kitchen facility. They visited the Bakery and the Sukhadi and were most thrilled to observe the quick processing of the rotis by the giant roti making machine. The team members also enthusiastically took part in the cooking process of the mid-day meals. With great interest they watched the packing and the loading processes. They also took time to understand the food lab processes as well. There they also interacted with the Operations Manager to understand more about the Akshaya Patra kitchen in Ahmedabad.